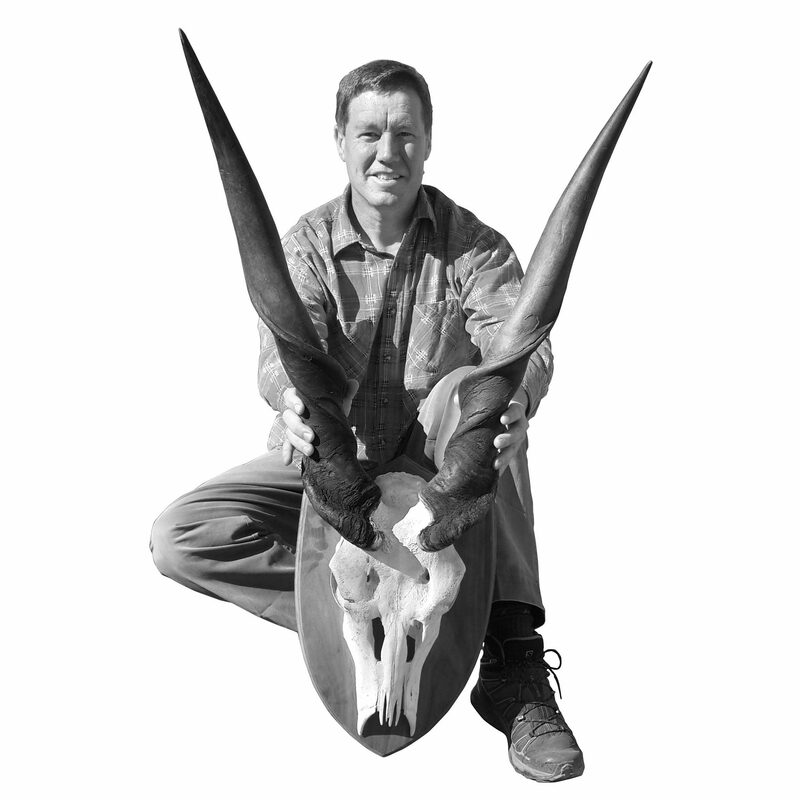 I am hunting on Farm Saamgewaagd, Peet Vermaak’s farm in the far east of the Otjozondjupa Region. The terrain is flat and thickly wooded, mainly bush at shoulder height, with here and there a bigger tree in between camel thorn or sweet-thorn. The hunting area consists of so-called “dunes” and “streets”, although the “dunes” are not perceivably higher than the “streets”, but they are thick sand with a different type of vegetation, mostly apple-leaf trees. The “streets” consist of lime soil, with patches of ghabba bush, blackthorn bush and raisin bush. All of them are difficult to move through and they make it impossible to see further than a distance of thirty metres or so. Here and there you will spot the green sprouts of the notorious poison leaf, a plant that for many years prohibited farming in this area, but allowed the well-adapted game animals to prosper. I am now moving slowly down such a street. The big tracks led me on since daylight, over dunes and along streets, for hours. 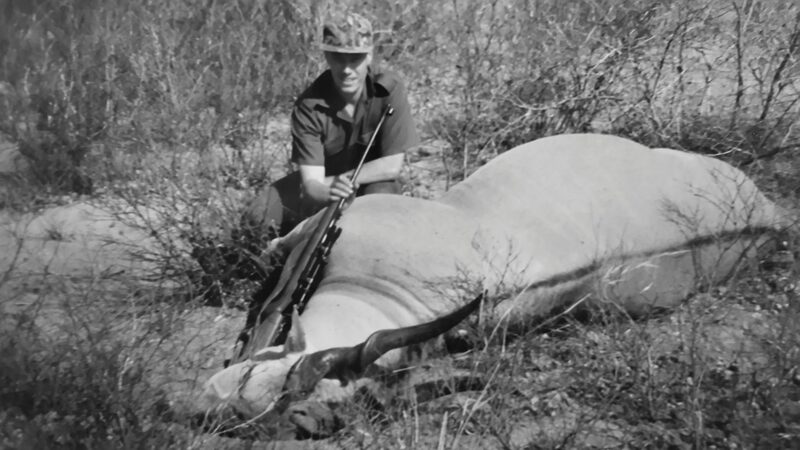 From my previous eland hunts in this same area, I knew that I had a good chance of finding my prey if I managed to keep on the spoor. Getting a clear shot, however, is not so easy. These animals often hear the hunter coming before you even see them. 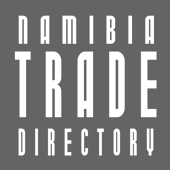 Only the crackling bush hints at a running eland – and a lost opportunity. Then the tracking process has to start all over again. Eland stop feeding from around eleven in the morning and look for shade under a big tree. There they are very difficult to approach, as they stand looking downwind, while the scent of any danger is carried to them from upwind. They stand listening closely for any suspicious noise. Normally it is only possible to catch them unawares early in the morning or late in the afternoon when they are feeding again. Is it my imagination or did I just hear a noise in the bush in front of me? It may be a hoof stepping on leaves, or a branch breaking. I cannot be sure, but it is definitely something big. I stand stock-still and listen intently. The bush is as thick as ever and my vision is limited to about thirty metres. I stoop down and try looking through the bushes from underneath. Nothing. en, there it is again – I hear movement. It can only be the eland bull that I have been tracking since morning. There are no cattle here, and the ever-present giraffe I would have seen towering over the surrounding bush. The sound of this movement is too heavy for a gemsbok or a kudu. Right in front of me, I see the branch of a bush moving. Was it a bird or an animal? The eland I am after? Now I can see the tips of two horns flashing in the sunlight. It is the eland. He is feeding on the tender leaves at the tip of the branches. I consider moving to a better position but fear that he will notice me. What should I do? One wrong move and the hunt will have to start all over again. I do not want this to happen after three days of searching and tracking and trying. The next moment the bull makes his move. I see him walking towards a clear patch in the bush. I think I will get my long-awaited opportunity now. I know the bull by now. I have walked on his tracks since dawn. Those were big tracks. Now I can see the horns clearly. They flash in unison as he feeds, the shiny black surface and the sharp tips show against the hazy backdrop of the bush. And now I see the dark grey body, too, moving behind the brush. The eland’s head appears in the open, I see the thick tuft of hair on his forehead. I hear the click-click of his leg joints as he moves forward. Buck fever takes hold of me. My rifle is at the ready, but the sights keep swaying disturbingly. I try to calm myself. The moment has come. If he detects me now he will take flight and keep running without stopping soon. I can see all of him now. For a moment he is fully in the open. He stops abruptly and looks straight at me. My sights anchor on his foreleg. I press the trigger. The rifle bucks against my shoulder. I hear the shot as if from afar. I see the big animal stumbling, then running. I know with a sense of accomplishment that this is his final run. He crashes straight through the bushes, not around them, breaking branches in his fear and agony. I hear him running for a hundred metres or so, then all goes quiet. I do not go after him immediately. I force myself to wait. This is a moment of contemplation, of retrospection and rest. I replay the shot in my mind. It looked good. I did not flinch or pull the shot. The distance was close enough to allow for a good margin of error. I tested my rifle on a target when I arrived on the farm. It was still good. The run of the animal sounded promising. I think I have him! I sit down, take an apple out of my backpack and slowly munch on it, savouring the sweetness and the moisture of the fruit. It amazes me how good a simple fruit like an apple tastes in the bush, when you are tired and where the air is clean and nature looks benevolently down on the hunter. My rifle is resting across my knees. I look at it and think back to the hunts we did together, me and my trusty 9.3×62 mm Mauser with its dark wood, its black barrel and its well-functioning BRNO-action. I feel a sense of comradeship towards the well-used piece of equipment. It never failed me. Together we walked on many tracks before, successfully pursued many a prey animal. After waiting for ten minutes I get up and start walking on the running tracks. The place from where he took off on his run is clearly defined in the soil. From there, his tracks form a straight line through the bush. I soon find blood. The drops of blood lie to the left of the spoor, a sign that the bullet did not penetrate the huge body but mushroomed inside it. Slowly I follow the blood drops. 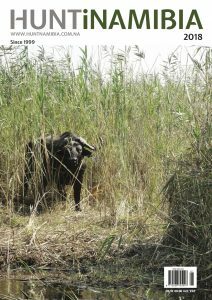 After sixty metres of tracking, I see him lying on his side in the low shrub. He doesn’t move. I walk up to him in awe. He is huge, a massive body and large horns. I am happy. I tell myself that I earned my success. It was a hard hunt. Three full days of hunting, of walking, of following the spoor. Today I have got him. He is mine. I hunted like a real primitive hunter: alone, without vehicle back-up or helpers, using only my senses and following my instincts. I take out the stomach and guts and place fresh branches over the body. It will take some time before we recover the animal. First I will have to walk all the way back to the farmhouse to report. I mark the spot with my GPS and start walking back. I am tired but happy. A sense of accomplishment fills my mind. It was a good hunt. To hunt eland in this way to me represents the ultimate hunt. I cannot get enough of this and will come back year after year for this experience. Although I may often return empty-handed, moments like this compensate for all the rest.